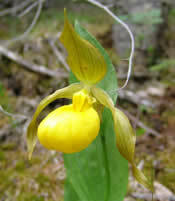 More than 40 taxa of wild orchids have now been reported for British Columbia, including lady's slipper orchids, rein orchids, bog orchids, twayblades, helleborines, and the ever elusive phantom orchid (Cephalanthera austiniae), a mycoheterotrophic species. 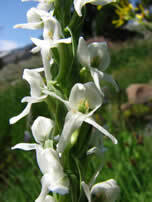 Our orchid flora recently expanded by one species, with the 2007 discovery of Ute ladies' tresses (Spiranthes diluvialis) in the Okanagan Valley. Our wild orchids inhabit a variety of habitat types from bogs and fens to dry or moist open forests. Look for the fragrant white rein orchid along the shoreline meadows that border the Fraser River, or look for hooded ladies' tresses in the meadows on Grouse Mountain, or the low dune meadows at Boundary Bay Regional Park. 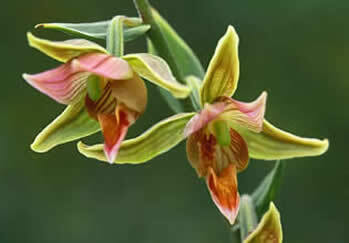 Or search for the introduced helleborine in shady woods in the southwestern corner of the province. 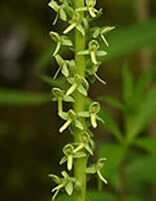 A list of the orchid taxa found in BC is presented below. This list follows the BC Conservation Data Centre official listings for the province, and includes recognized varieties for a few species. Douglas, George W., Del Meidinger and Jenifer Penny. 2002. 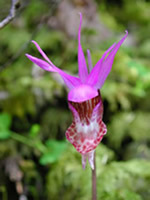 Rare Native Vascular Plants of British Columbia. Province of British Columbia. Victoria. Luer, Carlyle A. 1975. The Native Orchids of the United States and Canada Excluding Florida. The New York Botanical Garden. Szczawinski, A.F. (1969). The Orchids of British Columbia (Handbook No. 16, 2nd ed.). Victoria, BC: British Columbia Provincial Museum, Dept. of Recreation and Conservation. Williams, John G. & Andrew E. Williams. 1983. Field Guide to Orchids of North America. Universe Books. E-Flora BC: An initiative of the Spatial Data Lab, Department of Geography UBC, and the UBC Herbarium. © Copyright 2017 E-Flora BC.